In Italy, all international students are entitled to the same financial assistance services as Italian students based on same requisites of financial means and/or merit. There are government scholarships at the national and regional level to which international students can apply for. Moreover, some Italian Universities offer Italian scholarship programs for international students. Courses; Specialisation Schools; Research under academic supervision; Courses of Higher Education in Art, Music and Dance (AFAM); Advanced Courses on Italian language and culture Courses for Teachers of Italian as second language. It is only possible to apply for three, six, or nine month scholarships. The “Invest your Talent in Italy” programme, supported by the Italian Ministry of Foreign Affairs and by the Italian Ministry for Economic Development, offers students from Azerbaijan, Colombia, Egypt, Ethiopia, Ghana, India, Indonesia, Iran, Kazakhstan, Mexico, Turkey, Tunisia, and Vietnam the opportunity to develop their skills and specialise through a range of Master’s and postgraduate degree courses in English, in the fields of Engineering, Advanced Technologies, Architecture, Design, Economics and Management at prestigious Italian universities. The best students will be offered scholarships, sponsored by partners and main corporate sponsors. 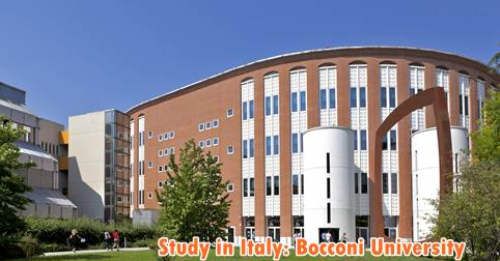 Bocconi University offers scholarships to international students enrolling in any eligible Bachelor’s Program or Master of Science Program at Bocconi. The scholarship includes full tuition waiver worth up to €11,500 per year for Bachelor’s Program and up to €12,700 per year for Master’s of Science Program. The UCSC International Scholarship is an annual tuition fee reduction promoted by Università Cattolica in order to foster the access of international student to the degree programs. The discount covers about 42% of the total cost. Students including non-EU international students enrolled in a full-time Bachelor’s degree, Master’s degree, Single Cycle Master’s degree, or PhD Degree courses at one of the Universities of Piedmont (i.e. The Politecnico of Torino, the University of Torino, the University of Eastern Piedmont) can apply for EDISU scholarships if they meet the merit and economic requirements of the competition. Part-time students can apply if enrolled in a bachelor’s degree. The scholarship amount varies depending on many conditions. Accommodation service can also be granted to non-resident students. The University of Padova also offers Gini Foundation Grants to support International Students who plan to attend a period of study or specialization at departments of the University of Padova in the scientific fields of Agriculture, Engineering or Mathematical, Physical and Natural Sciences. Scuola Normale Superiore is offering 78 fully funded PhD scholarships to both Italian citizens and students from outside Italy. All students admitted to the PhD program receive full financial support including tuition, fees, and a cost-of-living scholarship. All the information about Top 10 Scholarships in Italy for International Students has been delivered nicely; interested and talented students who are eager to pursue their Free Tuition/Scholarships/Study in Italy for Undergraduate, Bachelors, Postgraduate, Masters, PhD, Associate Degree and Other Degrees, can apply now. Labels: Europe Scholarships, Italy Scholarships, Scholarship.